The Sound Blaster Wireless for iTunes is the second external sound card that supports tha Mac platform (the first being the Xmod). This USB thumb-drive device allow you to stream music from your laptop or PC to anyrooms equipped with the Creative Wireless Receiver or the GigaWorks T20W Series II speakers. The bundled software will allow you to to set your rooms into zones and manage your song list effortlessly with the remote control (from the Creative Wireless Receiver). 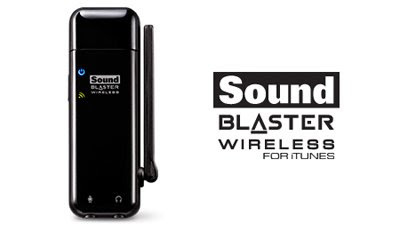 You can buy the Sound Blaster Wireless for iTunes now from Amazon at a price of $99.99.